Look for a feature on my fabrics in 5280 Home, April 2013. Last night I was invited to celebrate the debut of new artisan inspired textiles by Madeleine O’Connell. I was so excited to see the same exotic, timeless, and vibrant colors in her textiles as in her oil paintings. I truly felt as though I was looking into a kaleidoscope. Katie from Atelier Interior Designs stated that the quality of the fabrics are premium in silk or cotton/linen blend and are intended for upholstery and draperies and that they are also eco-friendly and printed in US. I’m now eagerly awaiting my fabrics which I will be using to make a few fabulous handbags which I’ll post in the near future. Madeleine O’Connell’s textiles are based on 25 years of oil painting and are amazing works of art!! Katie Schroeder and Erika Runkiks of Atelier Interior Design found Madeleine through her fine art. Many of Madeleine’s oil masterpieces are originally inspired from textiles and evoke a quality and beauty that is undeniable. What a great team! It is wonderful to watch one of Denver’s finest artist continue to grow and develop her astonishing talents. Last Saturday I rode my bike over to the Highlands to visit one of my favorite, and in my opinion one of the best, Denver jewelry artists, Madeleine O’Connell, of Gracious Lupita and Black Poodle. 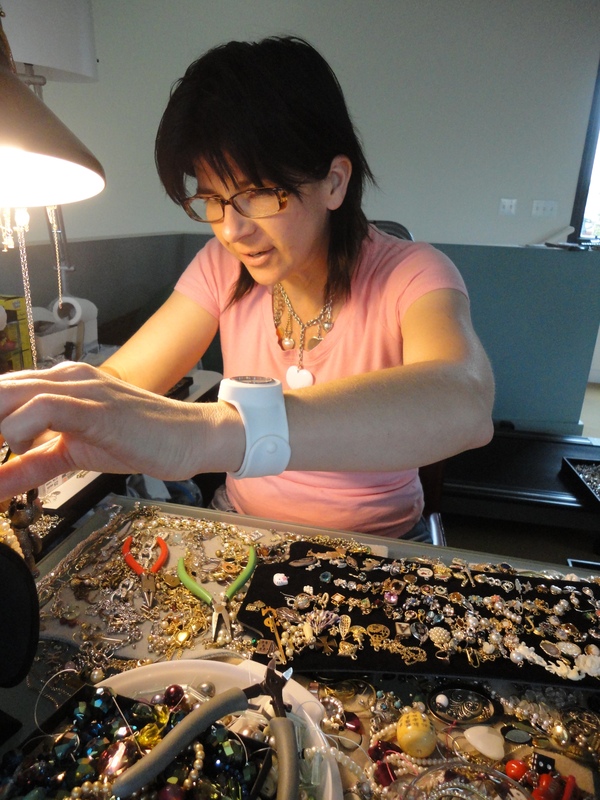 I was lucky enough to be invited inside her studio and take in the plethora of baubles in her jewelry assembling loft, (the downstairs is devoted to her paintings). I also got to meet Peter and Grace, her adorable poodles that inspired the lines’ names. O’Connell collects estate jewelry, broken and unloved jewelry, odd bits and baubles of just about everything imaginable (old watch faces, cameos, little toys and trinkets) and she recreates one-of-a-kind, magnificent pieces. In fact, the watch choker I wore when I got married was one of her pieces, and so were the blue earrings I wore on the day of my reception. I was in heaven surrounded by all her treasure! I couldn’t help but play in the strands of chain and pearls and play designer with O’Connell. She fastened a robot bunny to an amazing choker of chains and pearls for me, a sort of commission/collaboration. O’Connell expertly reworks a pair of clip on stunners into dazzling danglers or creates statement medallions and pendants out of huge belt buckles. Rather than competing with her friends in metal working who fabricated new pieces for her, O’Connell’s line stands at the head of the line in eco-fashion, made from 100% recycled and salvaged resources, and yet, I would consider her more glamorous and rich looking like that of Bulgari. You can find Gracious Lupita, romantic and feminine, atPerfect Petal, and Black Poodle, the funkier, edgier line at Posh boutique on Larimer Square. You can also find her work at Fleur de Lis, a paperie and accessories boutique in Greenwood Village at the Landmark, or visit her website here. She will also have a booth at the Denver County Fair, yes you heard me right, July 28th-31st.